Fortunately, most scorpions are harmless to humans. But getting stung usually hurt, and for many buthids it hurts a lot. It is known that special toxins (peptids) in the venom cocktail are responsible for the pain, but a new study by Shilong Yang, and co-workers shows that the acid in the venom increase the pain effects of the toxins significantly and thereby maximizing the toxin potency. If you want to learn more about this study, check out this blog report from Phys Org that explains the mechanism more in detail. Venomous animals use peptide toxins for hunting and self-defense. To achieve these goals, toxins need to bind to their targets with high affinity due to the small amount that a single bite or sting can deliver. The scorpion toxin BmP01 is linked to sting-induced excruciating pain; however, the reported minimum concentrations for activating TRPV1 channel or inhibiting voltage-gated potassium (Kv) channels (both in the micromolar range) appear too high to be biologically relevant. 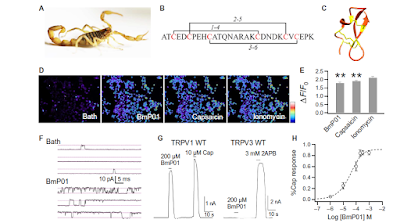 We show that the effective concentration of BmP01 is highly pH-dependent—it increases by about 10-fold in inhibiting Kv channels upon a 1-U drop in pH but decreases more than 100-fold in activating TRPV1. Mechanistic investigation revealed that BmP01 binds to one of the two proton-binding sites on TRPV1 and, together with a proton, uses a one-two punch approach to strongly activate the nociceptive channel. Because most animal venoms are acidic, proton-facilitated synergistic actionmay represent a general strategy for maximizing toxin potency.